My sister, Denise Prince, is someone who likes to do things in the background. Certainly not the spot light! She takes care of everyone but the elders and kids are her thing. She cooks meals for people in need and takes it to them. When people pass away she will ask the grieving family what she can do for them. She will clean their houses, take out the garbage and do whatever to help. Our mother got sick back in 2004. I had been taking care of her alone her in Utica and just couldn’t do it alone anymore. Denise had gone to live in California. I called her to see if she could come back home to help. She was working with an Evangelist called Sister Ma Clair. They had gotten together to do God’s work. She’s a spiritual woman for sure. And all’s well that ends well because Denise said she didn’t think twice about it. She left her job – money, sold what she could from her house and put the rest on the curb with a sign, “FREE.” It was good stuff too. Not many people would give up their life to move across the country to take care of an aging parent. But she left and didn’t complain about anything. This is another thing she does these things with no complaints. I had family right here in town who felt their jobs and their families were more important and didn’t help. 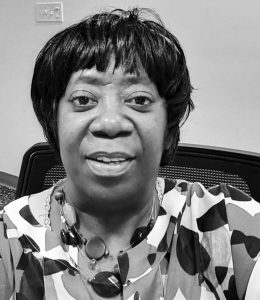 According to Cassandra Harris-Lockwood, CEO of For The Good, Inc. Denise is the oldest serving board member of the Board of Directors, “Denise Prince is an model board member. Not only does she show up to regular board meeting like clockwork but, Denise is always there to support our programs and activities. Her input is invaluable. Her compassion for others is played out in her service to the community. She knows the work we do at For The Good is unmatched and vital in our community. So, I’d just like to give her flowers and kudos while she’s still alive so she can smell and hear them. She happens to be my big sister, Denise Workman Prince. Email uticahphoenix@gmail.com for press releaeses.